Donation to Charlotte Eleanor Englehart Hospital for the purchase of Emergency and Supply Carts. The IODE Margaret Stokes is the Petrolia chapter of the National IODE. As IODE is a charitable organization, tax receipts are issued for any monetary donations that are received. We are grateful to have several knitters who are not members but wish to donate their talents. Volunteer your time by helping us as a hostess at the Christmas Home Tour, joining the assembly line making butter tarts, or any part of the process of preparing apple pies. Each member also records any volunteer or community service hours. At the end of each year, the tally for each chapter is sent to the provincial level. This past year, at the municipal level, IODE donated $37, 834. worth of items to local nursing homes, hospitals, schools, Big Sisters, Women’s Interval Home, food banks, Christmas for Everyone, Lambton Rural Child Care. Articles sent to Neo-natal Care, our adopted school in Labrador and IODE Ontario for distribution in the north include knitted sweaters,afghans, mitts, preemie bonnets, toiletries, books, clothing, and school supplies. The IODE Margaret Stokes Chapter is proud to be involved in many community projects, as well as supporting Provincial and National initiatives. Refer to our Project page to glance at some of our achievements. 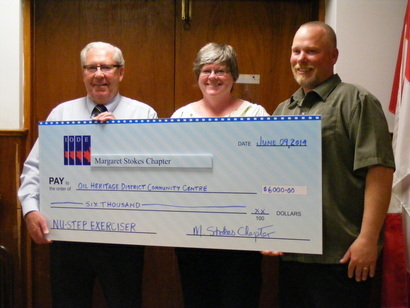 Cheque presentation for Nu-Step Exerciser at the Community Centre.